Below are short summaries about each of our building and construction products as well as links to detailed information about each product. Our products can be used for many applications in construction such as roof waterproofing, underground damp-proofing, waterproofing of internal floors and walls, joint sealing and caulking, protection of metal surfaces, and thermal insulation of surfaces. We also supply admixtures for concrete and foaming agent for making lightweight foamed concrete. EABASSOC Concrete Foaming Agent: a highly concentrated, highly efficient, low dosage liquid which is quick acting and easy to incorporate into a concrete mix. 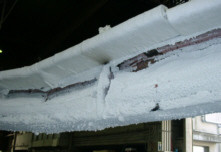 It is fed with water into an EABASSOC Foam Generator to produce a very stable, stiff foam which resists collapse. There are many uses for foamed concrete in the building and civil engineering industry. These include void filling, ground stabilisation, trench reinstatement and roof insulation. One of the most popular applications of foamed concrete is making lightweight building blocks, whilst the latest innovation for building is 60 x 50cm interlocking panels. EABASSOC RBC Aluminium - Protective Coating: a one coat reinforced, protective compound for the maintenance of sloping, corrugated metal and asbestos-cement sheet roofs. It is also suitable for over-coating bituminous membranes and mastic asphalt on flat roofs, and for general metal protection. Other colours available. EABASSOC TPU Waterproofing Membrane: a high performance, one component, solvent based elastomeric coating which cures to form a tough, flexible, UV resistant rubber sheet. Protects floors, walls, roofs and underground structures from penetration by water and water vapour. EABASSOC RBE Waterproof Coating: a versatile, inexpensive, cold-applied, water-based elastomeric coating, used for damp-proofing walls, floors and foundations, and for use as a roof waterproofing membrane in certain circumstances. EABASSOC Spraytec - Instant Waterproof Coating : a water based, spray applied system, which cures instantly to form a seamless, highly elastic waterproofing membrane. It consists of a special rubber bitumen emulsion and a liquid precipitant, which when simultaneously sprayed, produce an instantaneous solid membrane on the substrate. EABASSOC Spraytec - Instant Waterproof Coating has a variety of applications in construction and civil engineering. These include waterproofing roofing, tunnels, underground structures, foundations, slurry walls, water channels and reservoirs. It is principally used for coating large surface areas or where fast curing waterproof membrane is essential. EABASSOC FR - Fire Resistant Coating: a water based polymeric vapour barrier coating, provides a fire resistant (Class "O") weatherproof coating, suitable for both internal and external use. It is used primarily to protect modern insulation materials and for asbestos encapsulation. EABASSOC Elastotherm AC - Thermal Insulation Coating: a ready-to-use, water based coating with excellent thermal insulation, anti-condensation, anti-corrosion and anti-carbonation properties. It reflects and emits heat, reduces the need for insulation and keeps buildings cool on hot, sunny days. EABASSOC BSP - Anti-Corrosion Coating: a high quality, polymeric, water based chemical converter and primer for rusted surfaces, which can cope with conditions where ordinary anti-corrosion primers will not function. It chemically converts damp and rusty surfaces, making them suitable for the application of high performance coatings without the need for special, expensive surface preparation. EABASSOC Waxproof - Anti-Corrosion Coating is a semi-soft anti-corrosion coating for ferrous and non-ferrous metals. Waxproof is used to stifle inaccesible corrosion and is ideal for the protection of enclosed steel work, such as box sections from rust. It is particularly suited for use on unprepared surfaces in circumstances where surface preparation is not practical, e.g. the box sections of motor vehicles, around bundles of cables, in ships' hulls and any other inaccessible places. Waxproof can also be used as a lubricant. EABASSOC RBC Aluminium - Protective Coating is also suitable for use as an Anti-Corrosion Coating. See Liquid Waterproof Coatings above. EABASSOC Lo-Mod - Elastomeric Joint Sealant: a one component, multipurpose elastomeric joint sealant, which is easy to apply and does not require a primer in most cases. It cures to give a very flexible, long lasting waterproof seal, capable of withstanding +/-50% movement and suitable for sealing expansion joints. EABASSOC Building Sealant Caulking Compound is a basic, inexpensive, oil based, external quality caulking compound for joint and crack sealing. It bonds well with most building materials and can be used both externally and internally. EABASSOC SBS and APP Torching Membranes: high performance torch-on waterproofing membranes based on SBS rubber and APP plastomer modified bitumen respectively, reinforced with nonwoven polyester. EABASSOC 100 PE - Self-Adhesive Sheet Waterproofer: consisting of a cross-laminated, high density, polyethylene sheet coated with a bitumen polymer adhesive compound. A robust membrane which is clean and easy to apply with excellent adhesion to primed surfaces and to itself at overlaps. Should I use a Torching Membrane or a Self Adhesive Membrane for waterproofing a floor or roof? 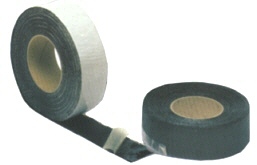 EABASSOC Flashing Tape - Self-Adhesive Tape comprising of an aluminium foil backed by a flexible modified bitumen adhesive compound. It is used for the repairing of gutters, pipes, joints, glazing systems etc. and for covering cracks and joints prior to applying EABASSOC RBC Aluminium - Protective Coating and other liquid coatings. EABASSOC Concentrated Concrete Curing Compound is a wax based emulsion for use on fresh concrete, which prevents excessive water loss during the curing period. EAB Associates also offer a comprehensive range of ancillary products for the sealing and waterproofing of buildings as well as additional concrete related products. For more detailed information about the EABASSOC products, please click on the relevant links. Alternatively, submit a request form and we will be very happy to supply you with the relevant data sheets. Please note that all EABASSOC product information is given in good faith and every effort is made to ensure that it is accurate and up to date. It is, however, the responsibility of the customer to ensure that products are suitable for the required purpose and if in doubt, sample orders should be taken for trial purposes.